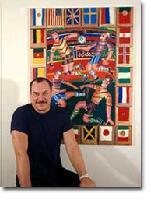 Yuri Gorbachev began his career as a Russian ceramics artist. He arrived in the United States from the former USSR in 1991 and over the following years traveled extensively, spending many months painting and exhibiting in Southeast Asia. He incorporated these different worlds and experiences- Russian, American, and Asian, into his art, and changed and developed into the unique artist he is today. His work is now represented in the permanent collections of the Louvre, the Kremlin Museum, The Palace of Alexander the Third, The Rudana Museum, Bali, The Seni Rupa, Jakarta The United Nations, the White House, and more than twenty other museums worldwide. Gorbachev was classically trained in Soviet art acadamies and also acquired advanced degrees in philosophy and communications. His most notable accomplishment through his art has been his success in bringing many different cultures together in his own simple language and beauty. Gorbachev's artistic career flourished in New York City and in the following years he had solo exhibits all over the United States and Europe. In 1994, Stolichnaya commissioned Gorbachev to design their annual Christmas "Holiday" ads for the famous Russian vodka, which have appeared in hundreds of magazines around the world. Now living in New York City, he is the brightest and most well known of the artists who came to America from the former USSR. Americans of culture recognize Russia through his art. In the New York Times journalist Carey Goldberg said "There is no better interview subject than a man who just wants to make people happy. A man so brimming with energy that he repeats and rerepeats words of emphasis, a man with a mission so simple and sweet that it works for Americans and Russians and Indonesians alike. And there is no better art, to my taste, than art that radiates the same kind of joie de vivre so that it acts as a tonic on all those who see it, uplifting not only with its beauty but with an exuberance as potent as the blooming of northern plants in summer".